This sleep sack is a little larger than the Shell Sleep Sack, not as girlie either. Wouldn’t it be fun to embellish this one like the Seaside Wavy Bag? 2. Instructions are written for using two colors of yarn, the Sleep Sack in the photo was made using only one color, Red Heart Ocean. 3. When I use more than one color I cut the yarn for the color changes. It could be carried up without cutting, but I cut the yarn and wove in the ends. 4. When joining a new color, complete the joining slip stitch with the new color. 6. For scale my baby is 20 inches with a 14 inch head. I can't believe your sharing this pattern! Thank you VERY MUCH! I can't believe your sharing this pattern. I love these cocoon patterns! THANK YOU SUZIE! Hi Suzie, thank you so much for sharing such wonderful patterns. I am rather new to crocheting. Can you please tell me how many chains to do for the foundation row? You start with a ch 3. I wish to thank you so much for sharing this pattern with us. I've been looking all around for a pattern that I could follow and this is the best. God bless you for not being selfish and sharing it with us.. I think it is great to share this cocoon. I have made one using the tulip hat pattern (also a free web pattern) and a larger hook. The link to the Tulip Cap is on the right hand sidebar under Hats and Headbands. thank you so very much. This pattern worked up quickly and so very easy. I didn't think i could make baby items, although ponchos and hats are really easy for me. Any suggestions on a baby set (boy/girl) with buttons, that i hope i can do. I really appreciate all the free patterns you did for all of us. also, i changed colors the way you do, and i am very happy. I did not like changing colors without a knot, and was hoping the gift item i crochet did not fall apart. Will change color only this way. You are an angel. Donna, there are two sweater cap sets on the right hand side bar. The last line of the pattern was missing. It is there now. Thanks for noticing and letting me know. Hi Suzie, I live in the NW also but across the mountains from you in Addy, WA. I love your patterns, thanks so much for posting them. They definitely are an easy to do thing. Crocheting is definitely my main thing, altho- i garden and use the computer a lot. Thank you for sharing the patterns for the sleep sacks.... My daughter-in-law who is 7 months pregnant was just showing me something like this online that she had to have for the baby when we ran across your site!!! Of course she couldn't deside which one she liked better so I guess I better get crocheting... I will have to make all 3!!! I love all your FREE patterns! I have 2 yarn/craft online stores and am always looking to link to awesome free patterns and ideas for frugal crocheting, knitting, crafts, etc. I crochet/knit for charities so these are perfect. I also have a 3rd grandbaby coming so this will be a home-from-the-hospital gift! Thanks again. 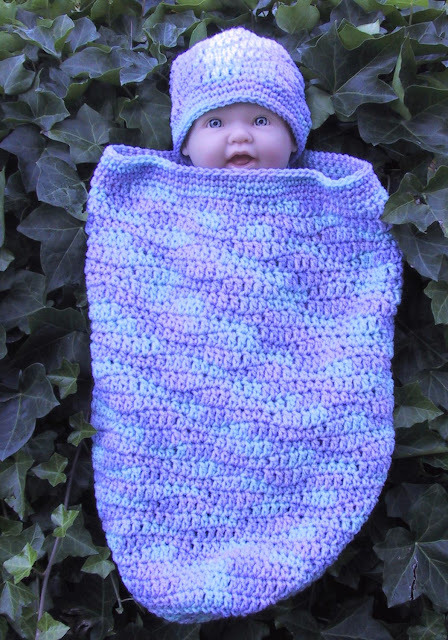 Thanks so much for shareing this pattern i have a 16 month old toddler that i would like to make this for as its impossible to keep blandets on her, being rather new to the world of crocheting am wondering if you could tell me what size hook would you recommend and would i need to add extra stitches to make it bigger as i go? once a gain thnks for a great pattern something simple yet functional as well as elegant how wonderful!!! I would use the same size hook and yarn. You need to measure her and decide what the circumference needs to be. Then keep increasing until the diameter of the bottom is 1/3 that measurement. Work round 6 as written. That should be about 10 inches across or about 31 inches in circumference. You will need to make it longer as well. I don't know how much yarn you will need. what size hook would you recommend if using a softer, lighter weight yarn (#3)? THanks. Can I just use variegated yarn? Sure use whatever you like. No crochet police here. I made this as a gift for my grandson who is due in July. If my daughter chooses to post him in it on social media what link would you like me to use. I always ask permission before anything is posted. It was an easy pattern. I did add a bit of design to it to make it more personal. I hope you don't mind. I'm okay with her posting it without a link.